Back in August, we went to see Twisted Broadway at the Arts Centre - it was a fantastic show and if you are into musical theatre I highly recommend seeing it when it comes back next year! 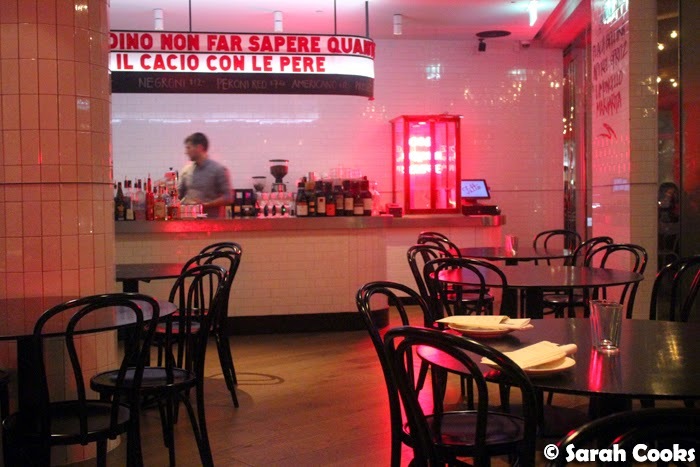 We wanted to get a nice meal beforehand, and decided to try Fatto Bar and Cantina, in the Arts Centre itself. 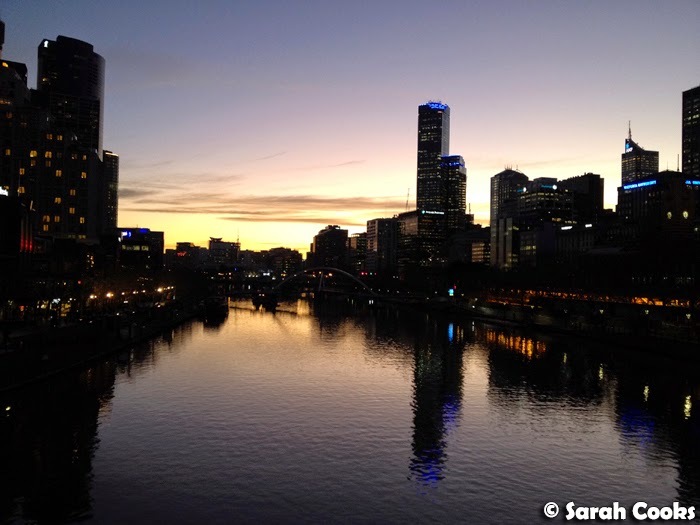 I'd seen heaps of great pictures from it on Instagram and Twitter, and it looked like it would be a good choice! We made a booking using the online system on the website, and it worked a treat. (I'm always nervous using online bookings, but come to think of it, I've had more problems with phone bookings than with online ones!) I liked the decor - clean white tiles, simple table settings - and the view across the water was pretty great too. Hooray for $7 cocktails during happy hour! 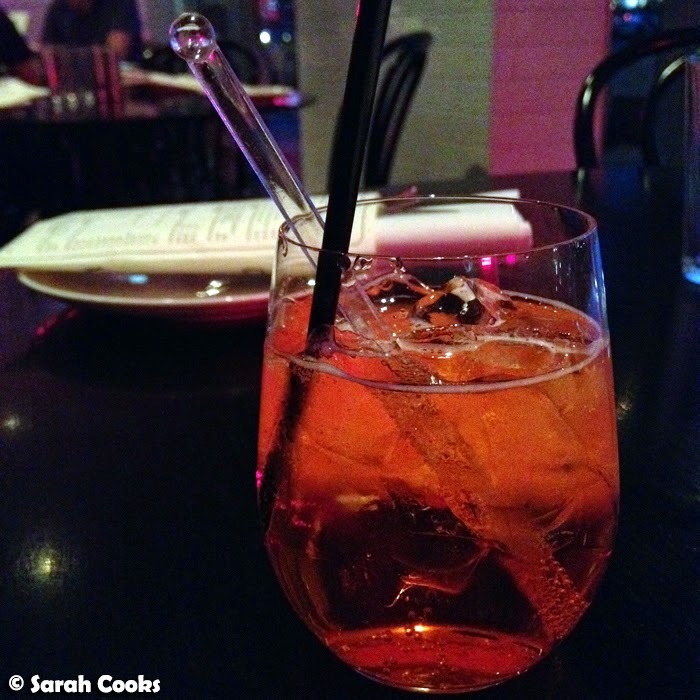 I loved the aperol spritz - I'm not sure if it tasted extra delicious because it was my first drink post Dry-July, but it was very very good. I was feeling very indecisive and couldn't choose between the different pastas and risottos, and in the end I chose crab spaghettini on the recommendation of our waiter. I'm glad I did, because it was great! 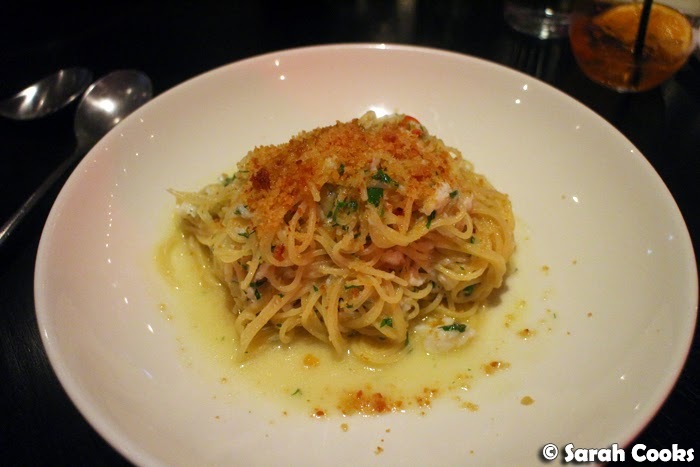 There were generous amounts of fresh crab meat, complimented by garlic, lemon, chilli and crunchy pangrattato. It's a classic combination for a reason! Sandra's mushroom risotto was also impressive, with a prominent mushroom flavour, and the rice grains cooked to a pleasing al dente. 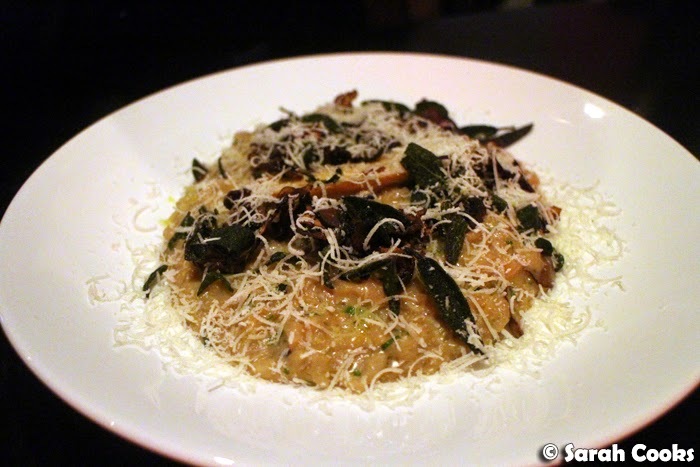 Also, crispy sage leaves are always a winner in my opinion! Of course, we ordered chips. 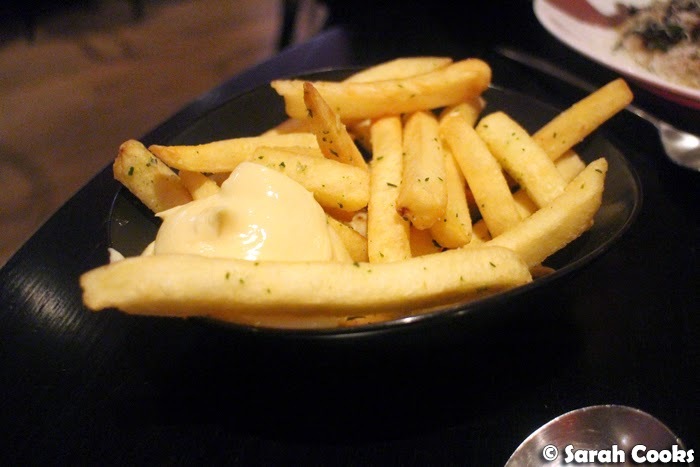 They were crispy, hot and tasty, with herbed salt and a generous splodge of garlicky aioli. After all those wonderful carbs, I was too full for a proper dessert, but still wanted a little something something sweet to finish off the meal. The $6 espresso granita was the perfect option. 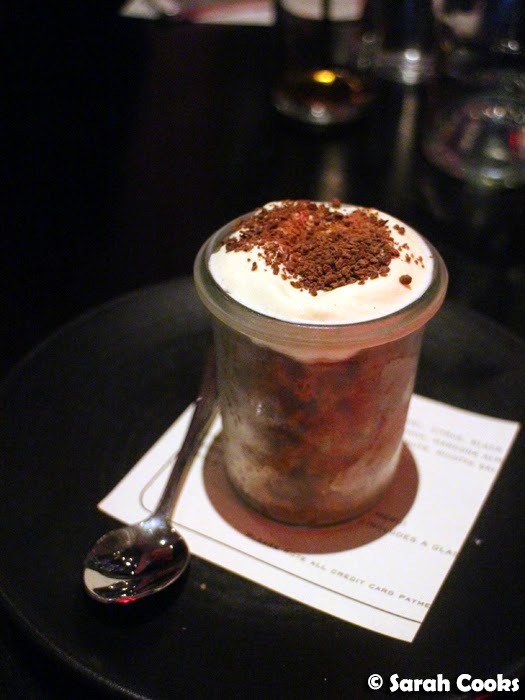 The granita was a frosted glass full of strong, sweet, espresso ice crystals. The cream on top was softly whipped, and semi-frozen where it came into contact with the ice crystals. With the sprinkling of chocolate flakes on top, it was perfectly balanced and so delicious! I wouldn't just think of it as a pre-theatre option, though. 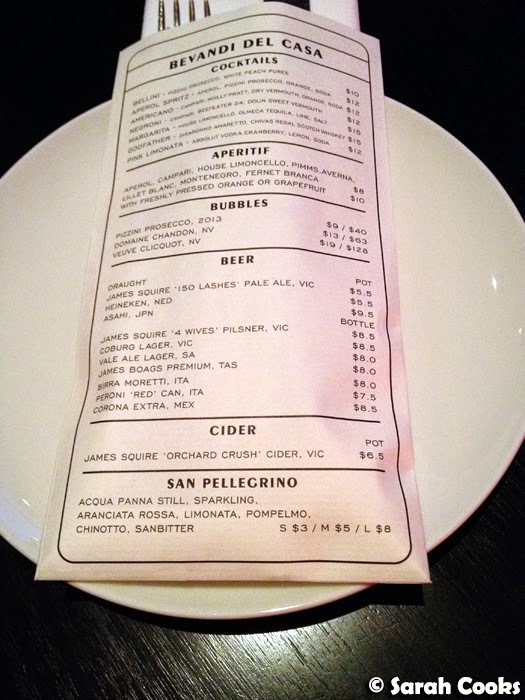 The location (walking distance from Flinders Street station) is very convenient, the atmosphere is nice, and the food is well priced, good quality and accessible. No crazy flavour combinations or trend-driven dishes, just simple Italian-inspired dishes, done well. I've recommended Fatto to friends looking for a nice place to eat, and can recommend it to you too. While we're talking pre-theatre options... I'll be going to see Les Miserables soon with a group of friends - can anyone suggest a nice pre-theatre option near Her Majesty's theatre? The food looks and sounds delicious as far as I can see it from here. You can't go wrong with those flavours. Enjoy Les Miserables! Hello $7 cocktails! I'm certainly a fan of them. Oh you did end up going to Fatto! The seared scallops I had there a few months ago were just ah-mazing!